For better or worse, South Korea is famous for its plastic surgery. Maybe the procedures help some put a better face forward. One offers a rounder head. One plastic surgery clinic in Seoul claims to offer the surgery for those "ridiculed" for having a flat or sunken back of the head. The procedure takes under an hour and involves a small incision. Surgeons use a type of bone cement to create a round head. Yes, bone cement. Apparently, it adheres to the skull, becoming part of the bone and only adding about 20 to 80 grams to the weight of the patient's head. Round head surgery isn't new; here's a story from 2011 talking about it, and here are photos from 2009 of patients who underwent the procedure. This month, it's once again appeared on South Korean internet forums. However, as far as plastic surgery goes, it certainly doesn't appear to be mainstream in the country. 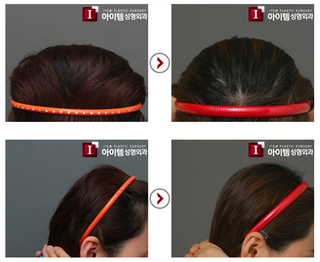 Recently, one South Korean site called the surgery "a bit much." It's hard to tell the difference! Also, most of those heads look pretty normal. There is a condition called "plagiocephaly" or "flat head syndrome" in infants that is corrected by wearing a helmet for several months as the child grows, forming a round skull. Then, there are the rest of us, who might have slept a bit too much on our backs as babies, resulting in a somewhat flat head. That's... okay. But in the above before-after photos, it's kind of hard to see a marked difference—or maybe I just don't care about the back of people's heads. Some folks, it seems, do.